Pimples, acne or sebaceous cysts, all are unpleasant and painful but the blind pimples or the under the skin pimples are more so because it is near the nerves deep within your skin. If you feel pain and swelling on your chin, nose or behind the ears, you should become ready for a red pimple that can now burst anytime through the surface of your skin. For the time being you can only see a slightly pink area of inflamed skin there. While nose and behind the ears are the most common areas where under the skin pimples develop, they can form anywhere on the surface of your face. The causes for these blind pimples are similar to the other types of pimples and acne which is overactive sebaceous glands. These glands produce excess oil which leads to clogged pores that trap dust and then become thriving ground for bacteria. The under the skin pimples are called blind pimples as they do not have head. They are larger than average pimple as there is more inflammation due to its deep site within your skin. This also makes blind pimples more painful. Closeness to the nerves is also one of the reason why these under the skin blind pimples are more painful than the normal ones. While most of the pimples form a whitehead or a blackhead, a blind pimple under skin gives an appearance that looks like a swollen pink bump onto your skin. Blind pimples are also known as papule. Like the average pimples, blind pimples also develop when oil and bacteria enter the skin pores where the bacteria keeps on growing, trapping the oil. It becomes a little more difficult to get rid of a pimple deep under your skin. When you take help of a warm compress, it softens the plug and draws oil and bacteria to the surface. Now fold the washcloth and place it over the area where you have a pimple under skin. Soak the cotton ball in milk and squeeze out the excessive milk. While honey itself is fine for fighting off pimples and the blind pimples, it becomes even more effective when you use it with apple pulp. Apple contains malic acid which is one of the Alpha hydroxy acids. When you apply alpha hydroxy acids to your skin, it excellently moisturizes and removes dead skin cells. Malic acid is in fact used for treating acne and diminishing acne scars along with firming and smoothing skin. When used for acnes and pimples including those that are under the skin, alpha hydroxy acids act by removing dead skin cells. They are also able to increase the thickness of deeper layers of skin. This firms your skin. Thus, it makes sense to use apple pulp for treating blind pimples too. Add honey to this and make it anti-bacterial too. 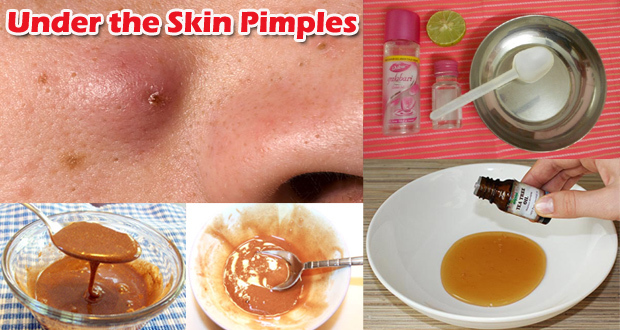 Mix well and apply this to your skin where you have pimple under the skin. Do this once daily till you get rid of blind pimple. Apple cider vinegar promotes blood circulation. It also has antiseptic properties and thus prevents infection from bacterial growth that often triggers an outbreak of pimple. As apple cider vinegar acts as an astringent, it helps close the opened up pores and thus seals them off from being invaded by bacteria. Leave it there only for very short time, may be for half a minute or 1 minute. Honey is natural anti-bacterial agent. Cinnamon too, like honey, has anti-microbial properties. Thus, it too and can stop the growth of bacteria and fungi. This is due to the chemical cinnamaldehyde which is present in cinnamon. This gives it its antibacterial and antifungal properties. Honey and cinnamon together makes a strong remedy for pimples and acne including the under the skin pimples. Citric acid present in lemon juice is also one of the alpha hydroxy acids. And as we now these acids make your skin smooth, firm and help remove dead skin cells. Lemon juice is also an astringent that naturally dries out the pimple under the skin. Not only this, lemon juice also perfectly cleanses your skin which helps remove bacteria and dirt. This speeds up the healing process of your blind pimple. Aloe vera is widely used to treat blind pimples due to many properties that it holds. Their antibacterial property prevents bacteria from giving you infection and thus accelerates the healing process. It is also anti-inflammatory and thus reduces swelling and redness related to it. Magnesium lactate found in aloe vera gel gets you rid of itching. Not only this, the astringent nature of aloe gel helps remove excessive oil and dirt from the skin, even from deep within, so that you don’t face further breakouts. As if all this was not enough, aloe vera gel also helps you get rid of acne scars that may be there due to the pimples. This is due to its component called anthraquinone which provides essential nutrients to your skin and thus boosts cell regeneration and repair. The salicylic acid present in aloe vera gel unclogs your skin pores and thus gets you rid of pimples including those under the skin. Witch hazel is the known natural astringent. Astringents can effectively contract the membranes and body tissues. This shrinking effect works upon the widely opened up pores. When the opened up skin pores close, they are protected from the further invasion of bacteria. Astringents are also skin toner and cleansers and they harden, dry and protect your skin from excessive oiliness. Witch hazel, being an astringent, contains all these properties and thus is a very good remedy for pimples. While hot compress is used to bring the blind pimples to head, sometimes ice is also recommended to be used to soothe the painful under the skin pimples. So, if you have a very tender and very painful blind pimple with excessive inflammation, you can consider using a cold ice compress too. Ice packs are particularly recommended if the pain from blind pimple is severe. Pain is caused by inflammation. When you apply ice, it cools the area and this cooling constricts the blood vessels thereby reducing blood supply to that area. Reduced blood supply helps fight off bacteria who cannot survive for long. Whenever you feel too cold or numbness, remove the pack and apply again after sometime. Repeat this 2-4 times a day but never keep the area cold with ice for more than than 15 minutes. This may damage your skin tissue. Avoid stress because it causes hormonal imbalance in your body. This in turn leads to acne and pimple. Reducing stress will certainly help avoid breakout of blind pimples. Exercise regularly because when you are physically active, you help increase blood flow inside your body. Blood carries oxygen and nutrients to your body cells to keep them healthy and disease free. It also contributes in flushing off toxins out of your body. Drink enough water to keep your body hydrated and to keep off the toxins. Lack of water in body leads to various complications in your body that may lead to blind pimples as well. It is proven that proper hydration improves skin elasticity and helps flush out impurities to make your skin glow. Have healthy and nutrient rich foods, especially fish oils and vitamin E. They stop inflammation and have positive effect on healthy cell growth. Never use hot water on your skin. Always use warm water, even if doing so for some home remedy like when giving warm compress to your skin with blind pimple. If you have been suggested to use toothpaste to get rid of blind pimple, you should know that this is not at all a good thing to do. This popular remedy for blind pimple in form of toothpaste might be useful for some people but in many cases toothpaste causes irritation to the skin. This may make the pimple under the skin even worse.